As we already mentioned in the post on “How to maintain dyed hair”, renewing our image and changing the colour of our hair is very frequent these days. 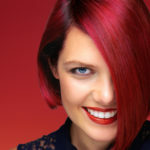 Dyeing your hair is nothing new, but the current dye and colouring trends are as they change each season. That’s why we are wondering what hair colours are in fashion at this time of the year. In today’s post we’re going to talk about the fashionable shades of the spring-summer season so that you’re always right up to date. Go for it and show off some trendy hair! This season those of you with brown hair are in luck, because brown and chocolate shades have burst strongly onto the scene; they are here to stay. This is definitively one of the fashionable colours for 2018. And why is this “traditional” colour so fashionable? Brown tones have always been associated with people with a more classical and natural style. This is precisely the idea: showing off brown hair with as natural a colour as possible. The very latest is to accompany it with the odd blonde or lighter shatush highlight (an improved version of Californian highlights) to brighten up your face. This is working with the famous #HairContourning as it is known to professionals. Last season the frozen hair or polar blonde colour was very fashionable; this almost white-blonde tone was favoured by several celebrities with their fabulous hair. Another favourite style among the rich and famous was granny hair, platinum blonde with shades of grey to give a cold touch to our look to match the winter season. In contrast, for this season we have the cream soda or soda blonde tone, a much milder blonde colour that softens facial features and gives brightness to our face. Golden or dark blonde tones combined with cream soda will give you a softer and more youthful look that is just perfect for the spring-summer season! Showing off a modern up-to-date head of hair doesn’t mean that you have to radically change the colour of your hair; the coppery tone is a good example. This colour is a true classic that is back in favour this season. As we have mentioned, for the spring-summer season trendy colours tend to be associated with natural looks. Emma Stone is one of the celebrities that come to mind when we think of this colour as she is always very proud of her natural coppery red hair. This tone will suit you as well as it does her if you have a porcelain skin and soft facial features. The wine hair colour is a reddish tone more intense than red hair with a cherry touch that is causing a sensation on the social networks in 2018. There is no doubt that wine-coloured hair is one of the sexiest tones of the season. It works very well for light-skinned people as it highlights the lips and makes your gaze more intense. As it is now fashionable it is the perfect option. And that’s it for today’s entry; we hope that you liked it and that you will try some of the trendiest colours of this spring-summer season. Go for it and show off one of these modern up-to-date looks. Don’t forget to leave your comments on the post here. Till next time!